Based on a widely republished article for The New Yorker by best-selling novelist Jonathan Franzen, Emptying the Skies aims to raise awareness of this devastating environmental tragedy and the journey of those risking their lives to stop it. 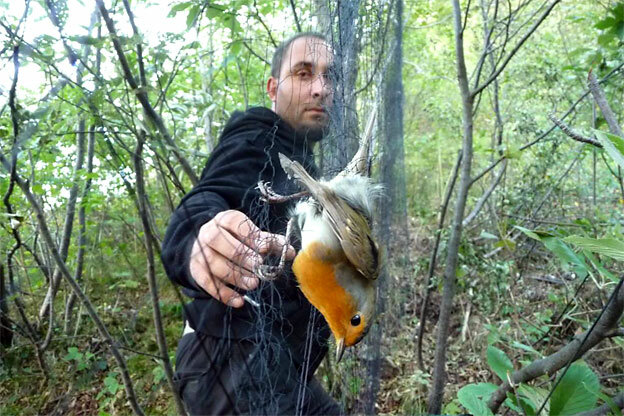 This squad of pan-European bird-lovers are waging a secret war against the poachers, disrupting illegal trapping to free as many birds as possible. Thanks in part to the awareness raised by the film and its subjects, positive changes are slowly taking place: poaching strongholds in northern Italy are dwindling, while attitudes towards the illegal hunting practice are shifting, with the Italian government now taking the matter more seriously and enforcing the laws more strictly. But, of course, there is still a long way to go. Good job done! For us, living in the northern parts of Europe, the capturing and eating of those tiny birds is utterly cruel and more in particular: not necessary at all. I recall a childhood memory: spending holidays in Italy (Lake district) one morning it dawned upon me there was something missing. The sound of birds! It was strange and eerie at the same time. Nowadays, I must add, the birds are back again but still leading a fearful life. I’ve never come to understand why grown men call this a hunt.